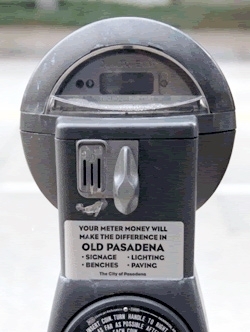 Pasadena parking meter revenue returns to neighborhoods where it is collected. L.A. plans to implement a similar program soon. Parking expert Donald Shoup has long asserted that one cornerstone of smart parking policy is to return parking meter revenue to the neighborhoods where the revenue is generated. When parking meters feed an anonymous city general fund, as much of the city of L.A.’s meter revenue does, then parking meters are perceived as burden to communities. When local meter revenue goes to fund local improvements, then neighborhoods tend to welcome the meters. There is a much-repeated Pasadena anecdote showing the power of revenue return. When the city of Pasadena wanted to install parking meters in its Old Pasadena neighborhood, there was resistance from local merchants. When Pasadena proposed using the meter revenue just to improve Old Pasadena, merchants responded: can we run the meters at night and on weekends!? Revenue return is key to generating the political will to implementing meters and charging appropriate rates for parking. Under a suite of parking reform motions by L.A. City Councilmember Bonin, the city and its Department of Transportation (LADOT) are moving toward a pilot program where a portion of parking meter revenue will be returned to neighborhoods. Bonin’s very Shoupista motion 15-1450-S4 calls on LADOT to begin a “pilot program that would return a portion of local meter revenue to the locations where it was generated” and for that funding to go to “transportation improvements.” LADOT is interpreting “transportation improvements” very broadly to include sidewalk repair, bike corrals, beautification, parking, etc. At today’s Transportation Committee meeting, LADOT appeared poised to begin the program in FY2016-17 in three pilot areas, with probable expansion citywide in FY2107-18. Where will funds go? LADOT identified a handful of potential recipients: Business Improvement Districts (BIDs), Parking Benefit Districts, a citywide non-profit, LADOT, or council offices. The department’s recommendation, with which Bonin concurred, would be to direct the funding to Parking Benefit Districts. These do not currently exist, but would be modeled after a similar program in San Diego. Parking Benefit Districts would be approved by the city, likely mostly organizations already operating in the community – such as BIDs or other community non-profits. How much funding will be returned, using what formula? No final formula was specified, but LADOT senior engineer Ken Hustings gave examples ranging from ten to twenty percent of overall revenue. The problem with a straight percentage would be that it would be inequitable, skewing in favor of already relatively well-off areas. Per Hustings guesstimates, with a straight twenty percent formula Westwood might receive $200,000 annually, while Wilmington might receive only $20,000. LADOT is proposing using a percentage but also bounding it with a minimum and maximum dollar amount. In Husting’s hypothetical example perhaps capping at $100,000 and setting a minimum threshold of $50,000. Councilmembers Bonin and David Ryu suggested that the formula “shouldn’t penalize” high revenue generating areas. They requested that LADOT only set a minimum, and no maximum. How will funds be distributed? There are further administrative processes to be worked out regarding distribution of revenue. The city could advance funds, or reimburse. Some funds may go to city departments for improvements such as striping bike lanes or repairing sidewalks, while other funds could go to local groups for smaller projects, such as trash clean-up or tree planting. Councilmembers were eager to get parking metered areas in their own districts to receive revenue from the initial pilot. LADOT will create a pilot selection criteria, but stressed that the pilot should include a diversity of types of areas, not only the high meter revenue areas like Westwood and downtown L.A. Though there was a great deal of enthusiasm for it among Transportation Committee members, especially Bonin and Ryu, the parking revenue return program will shift funding in the city budget, so it still needs to be approved by the entire city council. Currently the city’s parking meter revenue goes to a Special Parking Revenue Fund. The SPRF generates $81 million annually: $57 million from parking meters plus $24 million from city parking lots. After providing for LADOT parking capital, operations, and maintenance expenses, much of SPRF goes to the city’s general fund. Under a separate related motion 15-1450, SPRF would return revenue to neighborhoods, plus expand Express Park, code the curb, and continue to fund LADOT parking operations. With $81 million the funding should be sufficient to do all of this, but there may be further politics in how it can all be carved up–and local revenue return would not likely be enough to fund large capital projects, such as parking structures. The initial pilot details should be worked out when LADOT reports back to the Transportation Committee in 90 days. Sorry poor LA, we returned so much money to the wealthy enclaves who don’t need it that we have nothing left for you. I think the meter money should go to operations and maintenance first and then whatever is left over should go about 50% to the neighborhood and about 50% to the city’s general fund. That way the neighborhood and the City both have incentives to manage parking demand with prices. 20% for the neighborhoods seems really low to me, but better than nothing I guess. I don’t think the formula should have minimum and maximum amounts either. Just keep it simple. Neighborhoods with more parking meters get more parking money, as they should. I imagine that might be happening more now, then if the funds were actually sent straight back to the neighborhoods generating them… squeaky wheel gets the grease. The idea I had was that the minimum and maximum could be tied to (a function of) the number of meters (or, more complicated but perhaps better, to the number of meter hours operating) that way there is an incentive for additional metering. That way there’s still an incentive for more metering in areas (like Westwood) that are maxxed out. And there is less incentive to split areas into multiple entities each receiving the minimum. So if a poor neighborhood is only pulling in $20,000 from parking revenue and they find a way to increase that to $25,000, they get no part of that extra $5,000? What a colossally stupid idea. 100% of parking meter revenue goes to the community. 100% of the parking violation revenue (tickets) go to the general fund. And then, what about city-run parking garages? But we have seen this before. For example, say Hollywood decides to use parking meter revenue for sidewalk repair. In a couple of years, Hollywood’s general fund allocation for sidewalk repair will be cut equal to what it receives in parking meter revenue. Don’t believe me, look at lottery school funding. To ensure equal treatment of all neighborhoods, the city could give each Parking Benefit District the same annual revenue per parking meter. The city now earns about $50 million a year from its 40,000 parking meters, or about $1,250 per meter per year. So the city might give every Parking Benefit District $500 per meter per year, and keep $750 per meter per year for the general fund. Richer neighborhoods with higher parking revenues would subsidize poorer neighborhoods with lower parking revenues, but every neighborhood would benefit equally. Couldn’t one argue that funneling a portion of parking meter income to the neighborhoods might further entrench resistance to removing on-street parking (which might need to occur for complete-street treatments, etc.)? Or might it be possible for neighborhoods to receive a higher amount of compensation when they choose to swap out an on-street metered spot for a superior solution, whatever that may be? Or further, could neighborhoods get a higher level of compensation for metered spots that provide a parking-protected buffer for bike lanes?